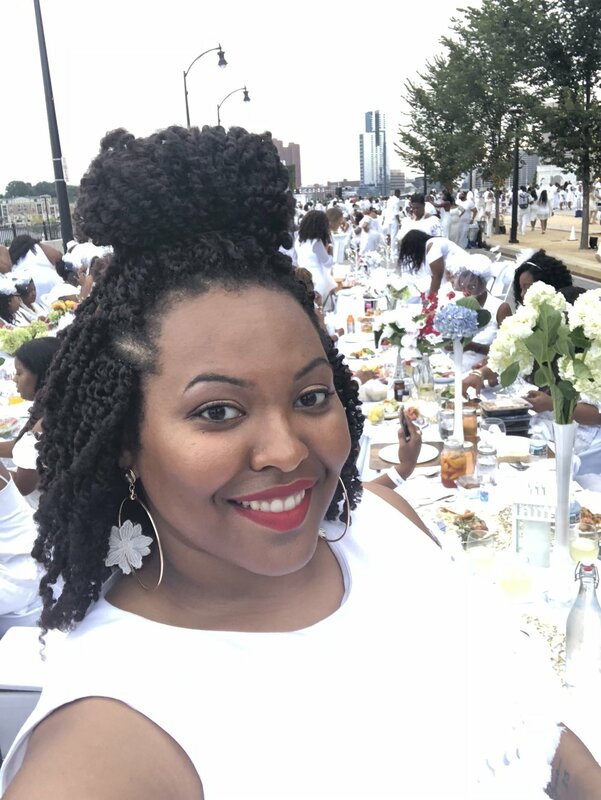 Diner En Blanc Baltimore 2018: Second Times the Charm! Diner En Blanc Baltimore 2018 was leaps and bounds better than the inaugural event!! My review of last years event was deemed harsh by some, but it was my experience and it was true! This years planning committee really took the feedback received by previous attendees and made all of the necessary improvements to make Diner En Blanc a great event. I was apart of the Owings Mills group; around 1:30pm we received a message that our meeting location was changing. I appreciated our Owings Mill group leader, Jade of Charm City Pretty, who got the word out early and communicated the change efficiently. Such a small hiccup really had no effect on the day. Once on the bus, my table leader Keesha handed out a nice favor and champagne grapes to everyone! Boonie at DEB Baltimore 2018! Oh anddddddddddd this year we had real sparklers! REAL SPARKLERS!!!! *again claps for the team* Once the sparklers are out it is time to party! The DJ was a bit better this year but I think given the demographics of the event, a different style of DJ would really make the party POP! However, this year because the event was better organized, we had ample time to socialize and dance. I actually got to see people this year! Diner En Blanc Baltimore you got it right! YOU GOT IT RIGHT! I stand by my thought that the "exclusivity" of the affair is the main draw. At least this year you got a damn good event for your efforts! I am so happy that it didn't rain, so I am not going to complain about the heat, LOL! Baltimore deserved an event like this. Kudos to the planning team, you really redeemed the event from last year and proving that the second time is truly the charm! So talk to me did you attend this year? What were you thoughts?